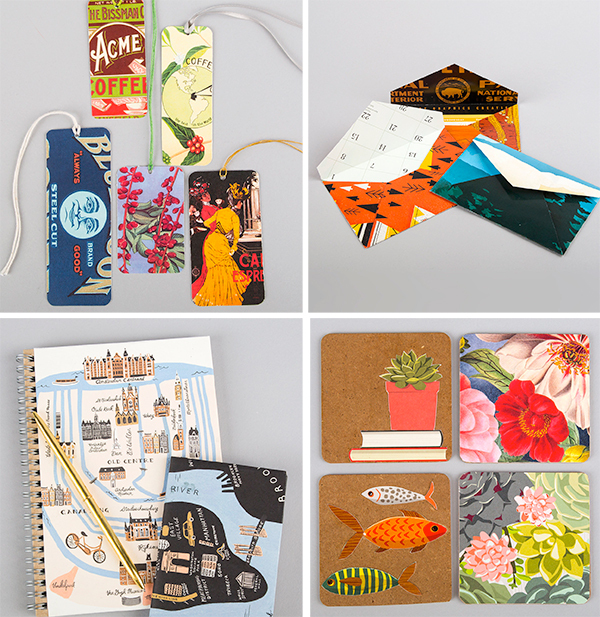 If we offered you quilty inspiration and eye candy for only SIX CENTS per day, would you take us up on it? Well, today is the day we’re offering you just that! 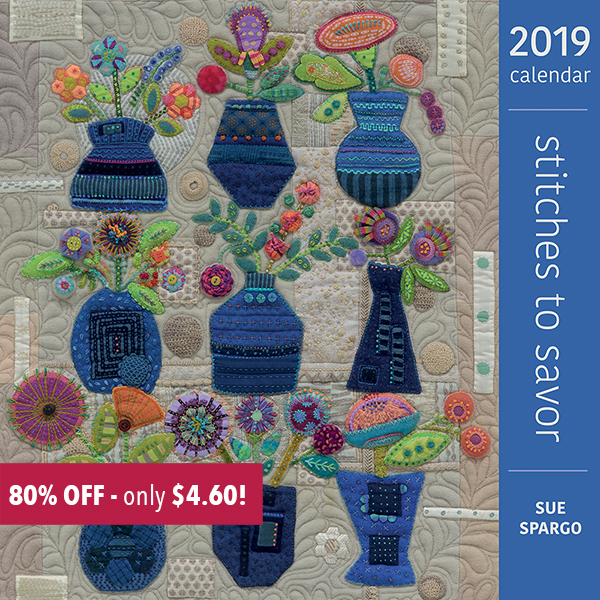 We can finally bring you this AMAZING deal: get the Stitches to Savor 2019 Calendar by Sue Spargo for only $4.60—that’s 80% off the retail price! Because it’s a time-sensitive item, the rest of our (quickly diminishing) inventory must be sold now. And that means YOU get a sweet deal—so why not pop a calendar in your shopping cart right now? Sue’s 2019 calendar is more inspiring than ever. For less than $5.00, you can give one to a quilty friend or one to yourself. Or both! You deserve to indulge, especially at such a great price! These magnificent hand-sewn works of art will have you yearning to put needle and thread to fabric—stunning, close-up photography captures every detail. If you’ve owned one of Sue’s previous calendars, we’re here to warn you: you might have a hard time letting it go at the end of the year. But guess what? You can remove the pages and use them to pretty up other items! 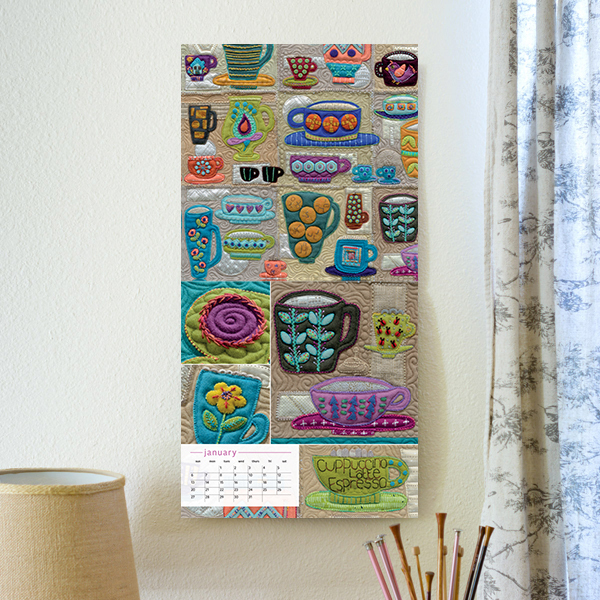 Grab your calendar before they’re gone and enjoy Sue’s breathtaking work all year long! What one project are you most looking forward to making in 2019? Tell us in the comments! I started a wool applique/embroidery wall hanging. It consists of birds and flowers. I can hardly wait to finish it. First I have 2 quilts to quilt for siblings, when finished I will have made 1 for each of my 10 brother and sisters. Then I have a mystery and Charity quilt to quilt. After that I have a large quilt that my sister asked my to make and need to make one for my daughter. I then want to make one for myself. Antelope Canyon pattern. In the meantime I also working on UFOS and a mystery quilt our guild is doing. Lots of sewing for me, yeah! I’m planning to make a wall hanging in celebration of my upcoming retirement. I am currently making a wall hanging for the new medical clinic that my children have recently opened. The pattern is called Stacking Rocks. I then would like to make a wall hanging from the new Bargello book. I am hoping to finally finish some projects – especially a quilt for my great nephew. I just want to finish some of my Phds!! I have QADD (like ADD only for quilters) I also want to "organize" my sewing space. Well, I can dream, can’t I? I want to finish a 36×36 wool crazy quilt piece I have been working on for???? 10 years??? Now is the time to finish it! I’d like to finish my daughter’s wedding quilt – She has been married 16 years now and I started 2 years before the wedding. Seems like we all want to get some of our UFOs done. Plus, I’d like to start (and finish) a winter scene in wool and flannel (table topper). 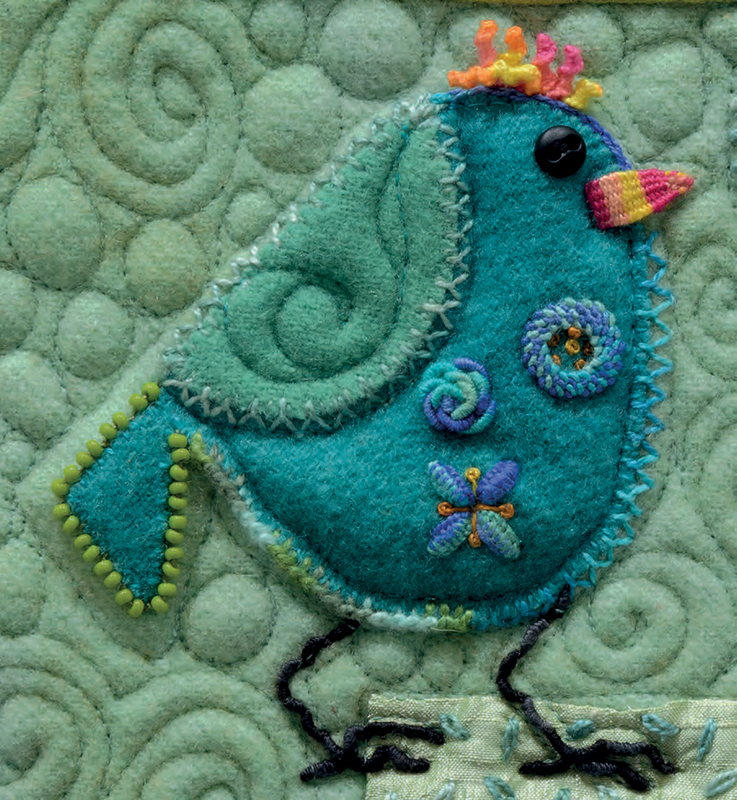 I just finished my 2nd applique quilt both of which I am entering in the Dallas Quilt Show in March. I am now ready to tackle a really complicated Christmas applique quilt. Hopefully it will be ready by Christmas this year. I am promising myself to finally complete the free motion work on my tree skirt made with very detailed Christmas Trees all around it. Our ladies group has been so busy making fidget Quilts for our local Alzheimer clients that all other sewing has been set aside! I need to get 2 quilts quilted for my daughters. Plus quite a few UFOs. And this is the year that I will tackle hand quilting a Crazy Patch started by my husband’s grandmother way back in the 1930’s. The project I’m most focused on this year is Spin Drift quilt. I really hope it turns out well.